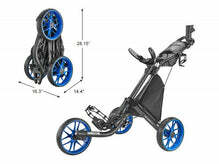 Tech Women’s Cart Bags have 14 full length dividers & an integrated putter well. Light-weight: weighing only 7 pounds. Shoulder strap is located at back of bag, allowing us to design more pockets and features in front side of golf bag. Coordinating detachable purse and rain hood included. Velvet-lined valuable pockets and velvet-lined easy access pouch for range finder. Several large pockets for functional storage. Two-zip off pockets for embroidery options: front lower pocket, large side pocket.